Full Price: $ 45.00 13% off! Manufacturer: Russ Berrie and Co., Inc.
Russ Berrie and Co. Precious Dolls, No. 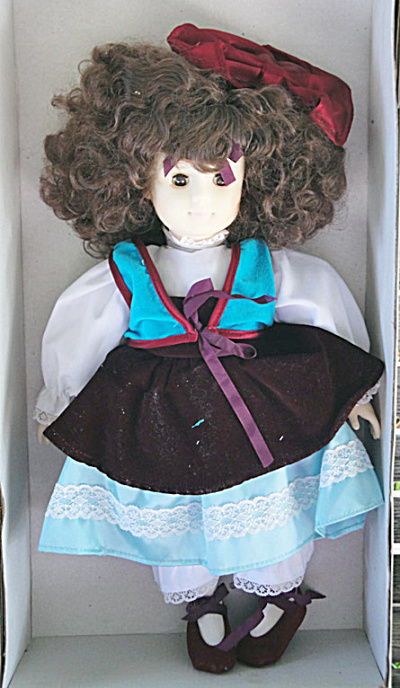 4705, Christina is a pretty 14 inch doll with a vinyl head, hands, and feet and stuffed cloth body from the 1980s. She is vinyl with paler bisque-like coloring. She has curly rooted reddish brown hair with bangs and a side part adorned with a large maroon bow and smaller ribbon, moving brpwm eyes, and a sweet, closed mouth expression. Her clothes are well made. Her outfit includes a dress with a blue bodice with long puffed sleeves edged with lace and an aqua satin skirt with white lace, an overdress with a teal blue vest edged with maroon piping and a short maroon velvet skirt, maroon cloth shoes that tie, and white socks. This doll, from my personal collection, has been kept in her window box over the years and only removed for photographs. 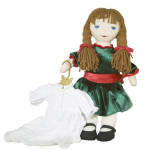 Old stock doll is in near mint condition except for the loose elastic of her white lace edged pantaloons. Expand listing to view both photographs.